Hello polished world! How are you today? Is everyone getting ready for Christmas? I can't believe it's less than two weeks away!! I think because Thanksgiving was so late this year, it's really throwing me off. At least I'm healthy now so I'm able to paint my nails as festively as possible. Today's manicure is no exception. 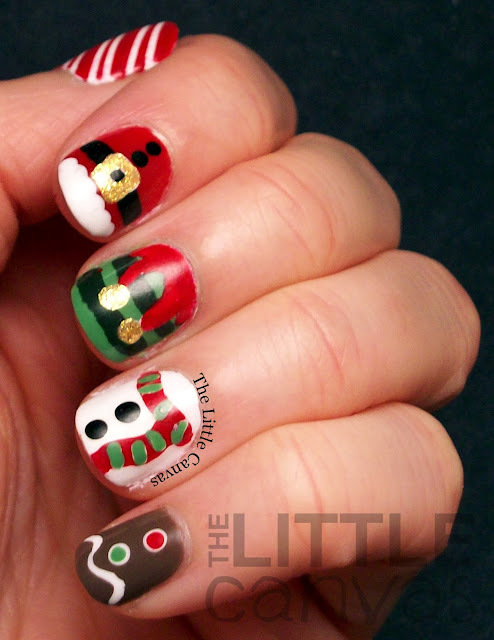 I think that this manicure is by far my most festive manicure ever!! I debated on posting it now or waiting until closer to Christmas, but I thought if I shared it now, people would become inspired for the holiday! I got the idea from this pin on Pinterest which sadly leads to a link which gives no credit to the original artist. If you're the one who painted those nails, please let me know! Looks like it was stolen off of Instagram because it has a weird filter on it. 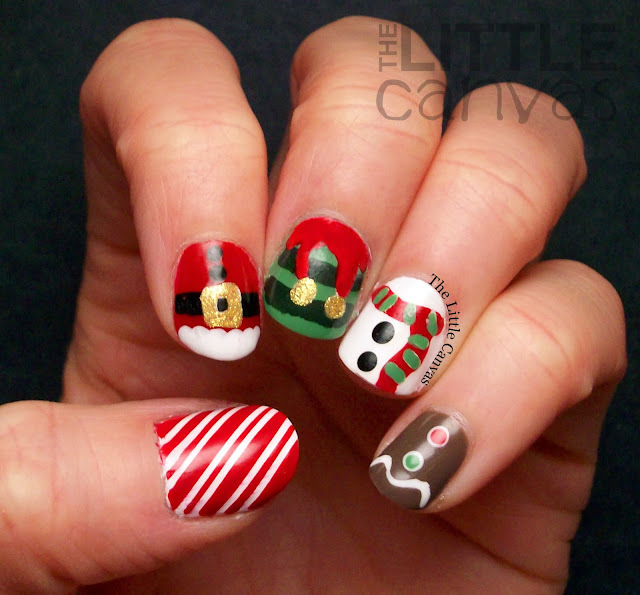 Anyways, after seeing this adorable Christmas character manicure, I knew I had to try it. It has been awhile since I have done an extensive manicure such as this, and I forgot how much I love doing it. Seriously, it took close to two hours to do both hands, but it was totally worth it! Let's take a look. Sorry again about my photos. I'm going to buy another light this week to hopefully fix them. 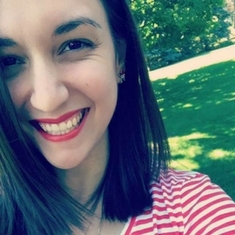 This is kind of a long post. If you want to see the colors used and how I painted the cuties on my nails, please read on! Whew, that was a lot! Okay, time to tell you how I got the look. I wanted to do a tutorial, but I got kind of distracted with my new nail art wheels that I ran out of time. 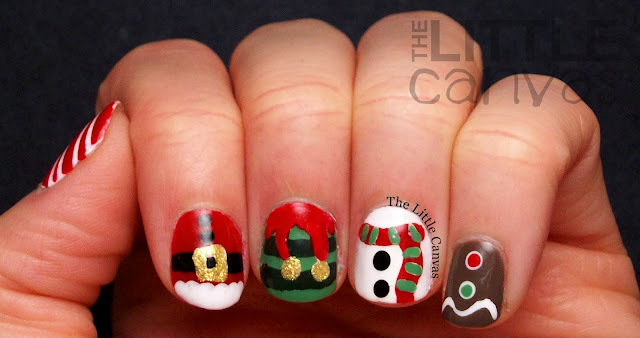 Let's start with the candy cane, which was the second easiest nail. Ready for the easy peasy? I painted my nail two coats of white and let it dry while I painted my other nails. After I was done with everything, I took my nail art tape and stuck it down in different ways to make thick and thin red lines. Painted on a coat of Livingston, removed the tape, let dry a bit, and added top coat! Next was the Santa nail. Probably the third easiest of the nails. I started off with a base coat of Livingston, which really is a perfect Christmas red. Loving this color. When that was dry, with my nail art brush and Liquid Vinyl, I painted a black line across my nail. With my white polish and a dotting tool, I dotted in the tip of my nail. After this, I went back through with my nail art brush and painted on the buckle in white first. I did this because I did not believe that Kerry would show up on the red. When the white was dried, I went over it with Kerry, then added the two black dots above the nail. Bing bang boom, done. Next we have the hardest nail, the elf. Seriously, this one was the death of me! I started off with a base coat of Josie, which by the way, kind of a perfect green for Christmas. I have gotten so much use out of this polish! When that was dry, with Hunter and a nail art brush, I painted these horribly crooked lines on my nails. I need practice keeping them straight. If you don't want to freehand, you can always use tape. When that was dry, with my nail art brush, I went through with my white polish and painted on the red collar thing and bells. After that dried, I went through with Livingston and Kerry and filled in the rest. This nail just took a lot of dry time and patience. It is doable, but a pain. Next is the snowman. 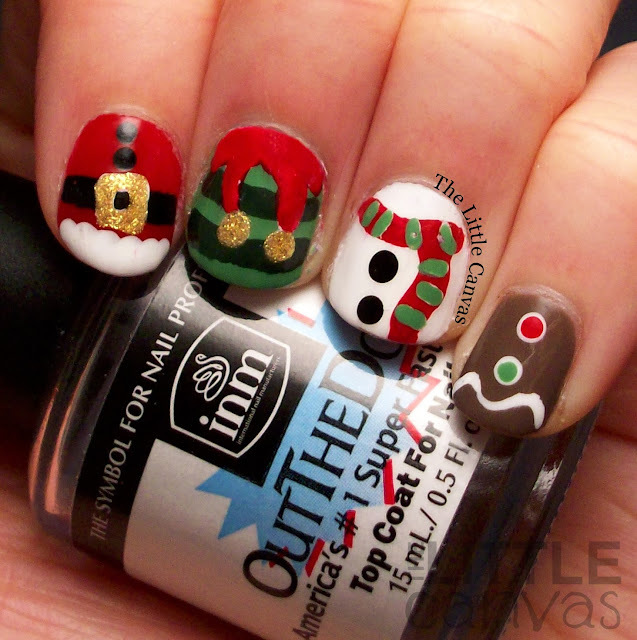 I would say this is tied with the Santa nail because of the scarf. I started off with a base coat of white polish. When that was dried, with my nail art brush, I drew on the little scarf. After the scarf was dried, I had to go through with my nail art brush and added white lines so the green would show up on the red. As that dried, I added the little black coal dots. I then went through with the nail art brush and added Josie over the top of the white lines. Bam, done. Kind of air bubbly as you can see, but oh well. Finally, the easiest nail, the gingerbread man. I painted my nails with two coats of Nirvana. Kind of an off brown which looked ginger-bread ish to me. I was thinking of using Zoya Louise, but I thought that was too dark. Good for a reindeer *hint hint* but not good for a gingerbread man. With my nail art brush, I added the white frosting swoosh at the bottom, and then used a dotting tool to add the frosting for the gumdrop buttons. Then with Livingston and Josie, I used my smaller dotting tool and put on the little gum drops. MANI DONE! I really kind of love these. When I was done with them, I took a webcam shot and shared them with all my friends on Facebook in personal messages. Everyone probably thinks I'm a nerd, but it was totally worth it. Also, since I started painting on my nail art wheels, I already have re-done this manicure so I always have it. As you can tell, I used mainly Zoya and Sinful Colors for this manicure. I cannot tell you how much I love using Zoya polish for extensive nail art. The colors I used are so saturated that I never find myself going back over to "darken" the color or make it stand out. I'm sure I could have accomplished this manicure a lot quicker and easier using acrylics (ex. might not have had to do the white undies under the red elf and green scarf), but something about using polishes is just really neat. What do you think? Loving the Christmas dudes as much as I am?? What is your favorite nail? Whew whew whew, this post is super long! I didn't think it would end up being this long, so I do apologize. I guess this makes up for some of my super short ones last week! Cannot wait to show you my Christmas nail art wheel and the rest of my manicures for the year! Until next time, <3.